Sunday is the day for the local Orchid Society Meeting. The meeting is held at Tyrell park on the outskirts of Beaumont. The day was sunny and perfect temperatures with a whiff of breeze to keep the mosquitoes away so we left a bit early to spend some time at the tertiary sewage treatment area. 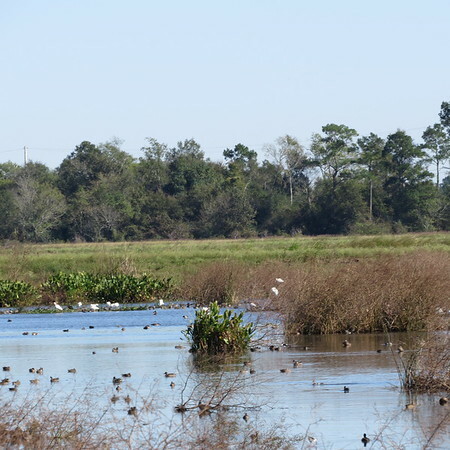 Swamps and bogs and marshes are on the city’s southern border and we are on the Mississippi flyway. Waterfowl are in abundance as they were today–with ibis and spoonbills plus cormorants and assorted other ducks. Unfortunately I could not get close enough to take good photos and those birds seemed to know how to camouflage themselves quite nicely but I did take a few photos and a short video of the sounds of the marsh. Not quite what any of you expected? How about listening to the sounds of the ducks? I admit to not being particularly computer adept; but today I am celebrating my linkup to Off the Wall Friday hosted by Nina. I’ve enjoyed looking through the various blogs of people whose names I recognize and others I don’t. Certainly it gives me an impetus to blog more frequently. Here is the linkup to Nina’s. Every time I hear that song by the HighwayMen, I think about my seventh grade science teacher informing us that there was no new water on earth; it had merely been recycled. That drop of rain that fell on my face might have been a snowflake crunched underfoot by Napoleon’s armies or under Jesus’ feet as he walked across the water or part of the Red Sea that Moses parted. Water is a precious resource and yet can be an instrument of great power and wreak damage. After Hurricane Rita, one wall of my shop had water driven straight through it peeling off the paint in long streamers while at home, the only water that came from the tap—when it did—was black! Hurricane Ike drove the water through the wall on the opposite side—the shop is a wood frame building and I was vastly surprised to find it still standing. The tap water was so salty from the incursion of the seawater into our drinking water supply, it was undrinkable. Two years ago, my husband and I had the opportunity to participate in a water well drilling in Honduras. Clean water there is a luxury and most women spend much of their day retrieving water from the nearest river—the same river that they wash their clothes in, their vehicles and the animals drink from. The luxury of a faucet with running water is something they can’t possibly imagine. A single drop of rain! Today is Blog Action Day; thousands of other bloggers are writing on this same subject.